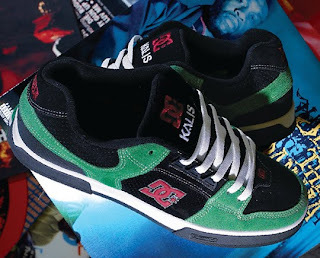 Skateboarder Josh Kalis and hip hop icon Jeru the Damaja recently came together to release a new colorway of Josh Kalis' DC JK7. The shoe is monster green and black suede on the midsole with the DC logo in red. Kalis' name can be seen on the tongue, and Jeru the Damaja's name is printed on the footbed. You can grab a pair of these now at the DC store.